Justin Meram throw out the ceremonial first pitch at a Cleveland Indians home game? No way. If the Columbus Crew SC soccer star was going to toss a first pitch for the first time at a Major League Baseball game, it was going to be at a Detroit Tigers game at Comerica Park. That’s exactly what happened July 6. Meram, a 28-year-old Shelby Township native, threw the first pitch before a game between the Tigers and San Francisco Giants. He bounced the baseball off his instep, then delivered what could have been called a strike to outfielder Mikie Mahtook, who was behind the plate. The Indians wanted Meram to throw out a first pitch at a game in August, but Meram didn’t want to do it. Crew SC players have thrown out the first pitch at Indians and Cincinnati Reds games last season and this season. Without being disrespectful, Meram made it clear he didn’t want to throw a first pitch at an Indians game. Crew SC and Tigers office staff worked on setting up a first pitch for Meram after the Indians idea was scuttled, and a miracle happened. A date was found when the Tigers were playing and Meram was in the midst of a break in the Crew SC schedule. Meram wore a No. 9 Tigers jersey for the first pitch ceremony. Tigers second baseman Ian Kinsler, a big soccer fan, was given a No. 3 Crew FC jersey. Those are the numbers they wear when they play. During a conversation, Meram and Kinsler compared notes on playing junior college sports in Arizona. Meram was the Junior College Men’s Soccer Player of the Year in 2008, when he led Yavapai College (26-0) in Arizona to a national championship. His 51 career goals still rank No. 2 in Yavapai history. 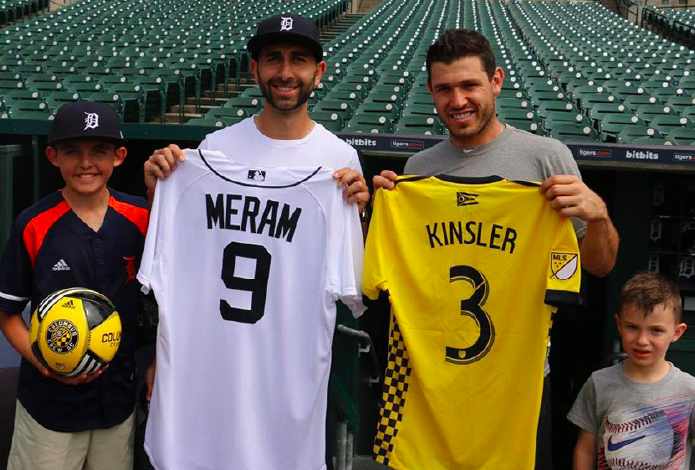 Julius Meram, Justin’s 12-year-old nephew, and Kinsler’s 6-year-old son Jack were on the field at Comerica Park for the first pitch ceremony and they got to kick around a soccer ball. Meram did several media interviews when he was in town. He was asked about the possibilities of Detroit getting a Major Soccer League expansion team and the International Champions Cup game between AS Roma and Paris Saint-Germain FC that was played at Comerica Park later in the month. Another topic was Meram’s future with the Iraq national soccer team. He’s appeared in more than 20 games for Iraq since 2014. Meram is eligible to play for Iraq because his father Hikmat and mother Lamia were born there. Meram is focusing his soccer efforts on Crew SC and not Iraq for the time being, but he said he’s spoken with Iraq’s new coach and isn’t shutting the door on playing once again for the Lions of Mesopotamia. One of the top wingers in MLS, Meram is having a great season. After signing a multi-year contract extension in March, the 6-foot-1, 165-pounder had scored a career-high nine goals and dished out six assists through 22 games, playing mostly at left midfielder. He was named the team’s MVP last season after scoring five goals and handing out 13 assists. He had eight goals in 2014 and six in 2015, when Crew SC made it to the MLS Final before losing to Portland. Meram was a standout soccer player at Eisenhower High School in Shelby Township and the University of Michigan before he was selected by Crew SC with the 15th overall pick in the 2011 MLS Super Draft. After playing two seasons for Yavapai in Arizona, Meram scored 24 goals in two seasons at U-M. He dressed with the U-M football team for its 2010 home opener against Connecticut, but football and soccer proven to be too time-consuming and Meram gave up football. Meram is also a co-founder -- along with his brother Francis, who is Julian’s father -- and technical director for the Michigan-based National Youth Soccer program. National Youth Soccer offers leagues and camps in Sterling Heights, Washington Township, West Bloomfield, Livonia, Woodhaven and Rochester with paid and trained coaches for families that do not want to invest in a travel soccer program.